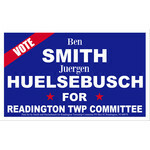 Smith and Huelsebusch for Readington Township Committee hasn't added a story. Ben, the current Mayor of Readington, is running for re-election. Formerly he has been a member of the Planning Board, Open Space Advisory Board, and Historic Preservation Commission. Ben has 24 years experience as a cyber security professional and is currently the Chief Information Security Officer of a US stock exchange. He has lived in Readington since 2002, and is married to Christina, a lifetime resident. Their two children (ages 6 and 8) attend Whitehouse Elementary School. Juergen is the current Chair of the Open Space Advisory Board, a member of the Hunterdon County Park and Open Space Advisory Committee, and a member of the Readington Planning Board. He is a Program and Project Management professional with over 30 years corporate experience, and is now a management consultant part time. Juergen and his wife, Lauren have lived in Readington for 28 years and have two grown children who attended Readington Schools. Please help Ben and Juergen raise money to get their message out to Readington residents. Smith and Huelsebusch for Readington Township Committee hasn't posted any updates yet. Smith and Huelsebusch for Readington Township Committee is managing the funds for this campaign.